Holly O'Hair & Poppy O’Hair are the twin daughters of Rapunzel, Holly is the one who is going to follow in her mother’s story-footsteps, while Poppy doesn’t have a destiny. Like with Ashlynn & Hunter, I ordered the twins’ two-pack online, hoping that I’d be lucky again and get the nice faces. Holly was reviewed last week, so this week is Poppy’s turn. Poppy’s motif is scissors, in keeping with the hair theme of Rapunzel’s daughters. She doesn’t have the long hair of Holly, her hair is an asymmetrical two-tone cut. Part of her hair is the same shade of red as her sister’s, the other side has been dyed a nice shade of purple. She also has a pink plastic moulded headband, the tied part looks a little bit like bunny-ears which is a bit peculiar. She has two different earrings, on one ear she has a pair of scissors joined with a chain to a cuff further up the ear, and of the other ear is a plain pair of scissors. Both are silver plastic. She wears this strange grey plastic cowl thing around her neck. I wasn’t sure what it was supposed to be, but reading about it, Poppy is known for her scarves, so I think this is what it’s supposed to be. It has a small painted purple & pink highlight on it too. It does up at the back with three toggles, but I have troubles keeping them done up. The scarf doesn’t fall off though if they aren’t done up. Her dress has a black and pink bodice with sheer red sleeves that have black criss-cross hatching on the. The skirt of the dress is shades of pink and purple with white braids and silver scissors printed on it. 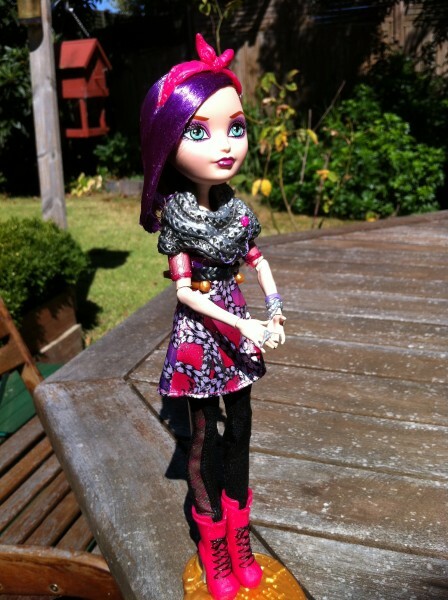 She has a black plastic braided belt that does up at the back with a toggle like the scarf. On one wrist, she has a silver and purple bracelet, and one the other hand she has a pair of scissors as a ring. Under her dress, Poppy wears a pair of black footless tights, with a panel up the outside of the same red and black criss-cross pattern that her dress has. She wears pink high-heeled boots with silver heels. The laces are painted black, and there is a pair of scissors on the heels as well. Like most of the dolls, Poppy comes with a bag. Her bag is super cool though, it’s a plain black plastic with a long strap and three little pockets. In each of the pockets is an item used in hairdressing! She has a pair of tongs, a comb, and a pair of scissors. And the extra cool thing about the scissors! She can hold them and it looks like she’s cutting the hair! 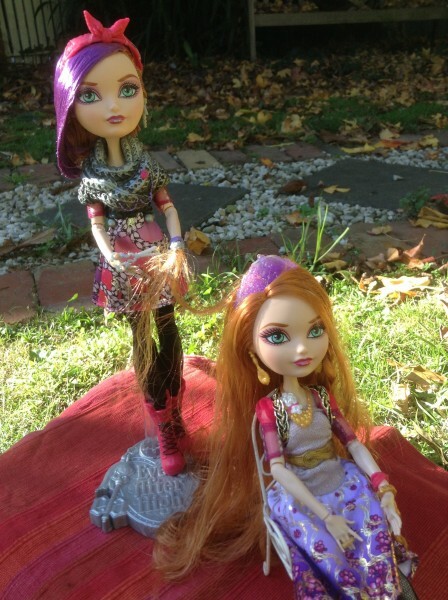 § Secret Heart's Desire: I want to find my Once Upon a Time at Ever After High. That being said, I'll never stop styling hair. § My "Magic" Touch: Being a daughter of Rapunzel, my hair is extremely valuable. In fact, I trim it every morning and put it into my savings account! § Storybook Romance Status: Believe it or not, I think Sparrow Hood is cute. He'd be a lot cuter if he'd stop singing about how great he thinks he is. § "Oh Curses!" Moment: My sister says I'm always looking for short cuts. I just don't see the point of going the long way around the tower. § Favorite Subject: Princess Design. From hair and makeup to fashion and style, I love making spellbinding princesses look edgy and modern. § Least Favorite Subject: Princessology. Just because I'm the daughter of fairytale royalty doesn't mean I want to be all prim and proper. § Best Friends Forever After: Besides my sister Holly O'Hair? Ashlynn Ella. We both work in the village of Book End, and often hang out afterwards. While I like that Poppy is truly alternative and means it, some of the others have alternative looks, but I feel this is more of an accident, whereas with Poppy it's deliberate, I can't help but feel that they created the character because they wanted twins, but then didn't know what to with the other twin that didn't inherit the parent's destiny.